Coming soon, the all-new MeetOMatic! The end of 2014 is bringing some radical changes to MeetOMatic that we’re really excited to tell you about! 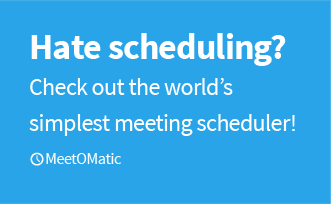 We believe that simplicity is key for a meeting scheduler, it’s what we’re all about and is what makes using MeetOMatic quicker than other schedulers. Over the years we’ve strived to retain this ease-of-use that our users love. However, we’re sure you’ll agree that MeetOMatic could do with a refresh. What are we so excited about? We’ve been working hard to figure out how to bring MeetOMatic up to date, while adding some brilliant new features without compromising on the simplicity that we’re known for. This re-design will be only our third iteration since launch way back in ’98, and it’s going to be the most radical to date. This blog should give you a little teaser of the new look; we’ll be announcing the full details very soon. In the meantime, why not follow us on Twitter for regular tips and updates (and even special offers when we go live)!